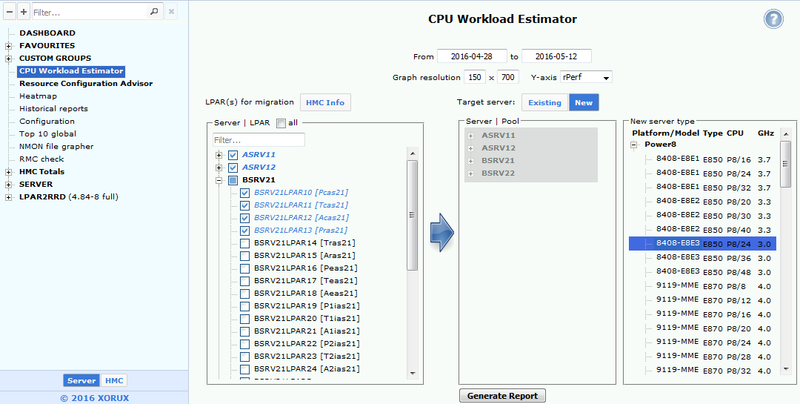 Read Migration to POWER9 article to see how CPU Workload Estimator can be useful in preparation for migration to POWER9. 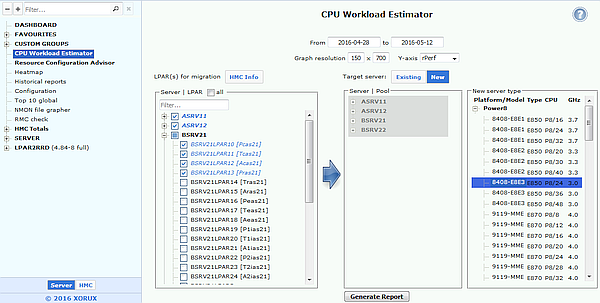 When you enter CPU Workload Estimator page, then simply select on the left panel target server and CPU pool and on the right panel select one or more lpars which will be migrated. Then generate the graph. Default time range is 1 week. You see how would look like the CPU load last week if lpars have been already there. In case of different platforms like target server is IBM Power 710 and there are going to be migrated lpars from IBM Power 795 then estimations based purely on CPU core will not be accurate. Therefore there is possibility on the main CPU Workload Estimator page to select rPerf benchmark for AIX® based server or CPW for IBM i (i5/OS) based server. Then estimations are based on that benchmark. This assures correct estimation for migrations between different IBM Power Systems™ servers. If you want to see that feature live then go to demo where you can try it. CPU core based estimations are available in free LPAR2RRD distribution. rPerf or CPW estimation feature is available only in the enterprise edition of LPAR2RRD distributed only to customers under support. Estimator takes into account actual SMT. Note: CPU estimation based on rPerf/CPW benchmarks are available only in the Enterprise edition of the product. Select servers or LPAR to be migrated to a new server. In our example whole 3x servers Power750 and a few LPARs another Power750. You can see that you might migrate such load. You can see 4 lines with maximal target server performance different for each SMT level setup. Migrated LPARs use SMT 4, target server has 358 rPerf for SMT4. Source LPAR have 200 rPerfs maximally in a peak.